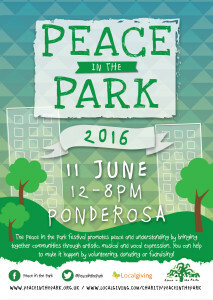 Peace in the Park believes that our world needs peace now more than ever. Peace in the Park intends to make a stand for peace in 2019 and beyond, to encourage a better, more equal world and to demonstrate the power of communities. We will promote peace and understanding by bringing together communities through artistic, musical and vocal expression. We want to create a movement of people, agencies, networks, all of whom have the same heart as Peace in the Park: to work together in the year, to connect with local communities to highlight the importance of peace. 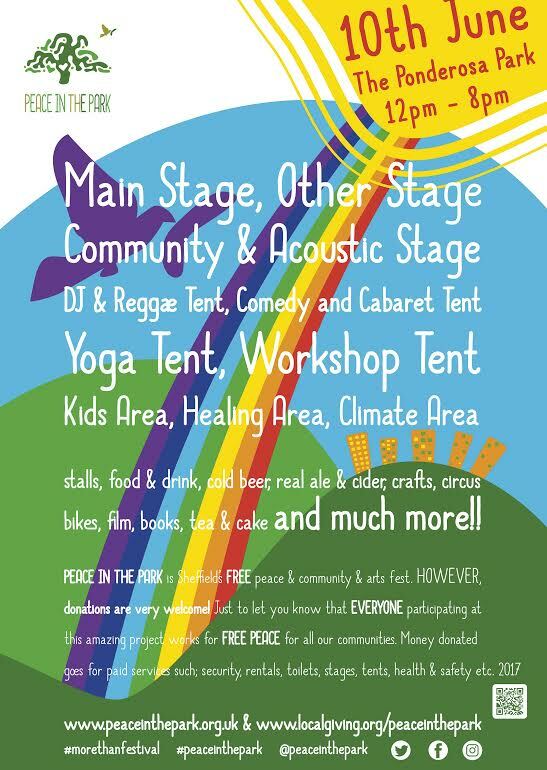 Peace in the Park festival is organised by a group of volunteers who are artists, musicians, students, events organisers and other everyday Sheffield folk, working together in a not for profit collective. The festival is funded by money raised in advance, to help make the festival happen. A great day on Sat 11th June 2016 once again on the ponderosa in upperthorpe. A lovely day regards weather and the rain held of untill 6.30pm. Great to see over 8000 people coming from all ages. This year we had a new area , the climate zone. we had a great team of volunteers of which the day could not have happened. the Axtos on the stages were amazing as ever. The plan was to have an all night fundraiser to raise funds for 2016 – unfortnutaly this could not happen due to venue and volunteer issues. The hugely successful 2014 festival was on Saturday 14th June at Ponderosa. Lovely weather with blue skies and the odd sunny shower but not enough to dampen the ground or our spirits! Over 7000 people turned out to listen to the live music, browse the stalls, join in with the workshops, or just enjoy a few drinks with friends. Well done to our nominated charities, ASSIST and Roundabout. Thanks to their hard work shaking buckets on the day, and the generosity of the people of Sheffield, they raised a combined total of £3000. This will be split equally between them, to help support all they do around the city. Check out this great video highlight reel by Nelly, our video volunteer for the day! 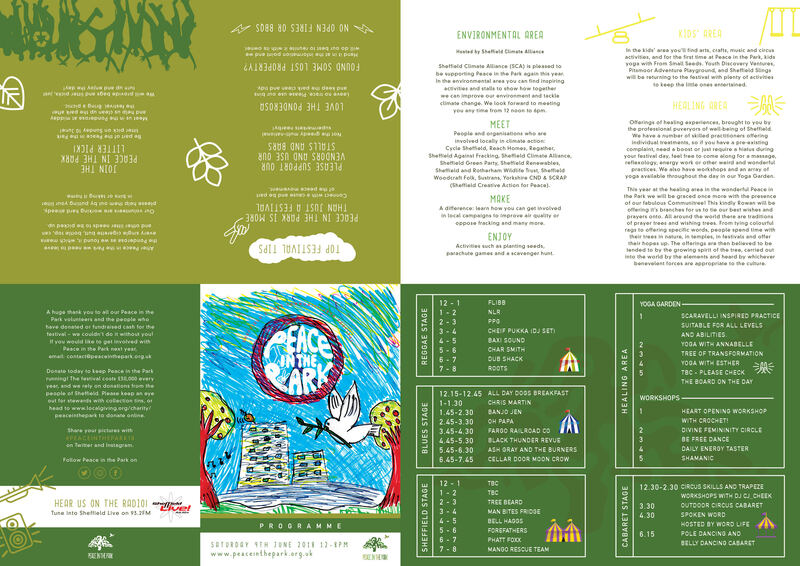 Peace in the Park 2013 was postponed until 2014 – see the press release or postponment FAQ for more details. Saturday June 9th 2012, Midday until 8pm. The 2012 festival was on Saturday 9th June back on the Ponderosa, and was the ninth Peace in the Park. Another bright, sunny year, with £3000 raised for CRESST and Names Not Numbers. In 2012, Peace in the Park did a radio show on Sheffield Live, to listen to the broadcasts go to the Peace in the Park podcasts. Back to the Ponderosa for another year, with bright sunshine bringing out the crowds. 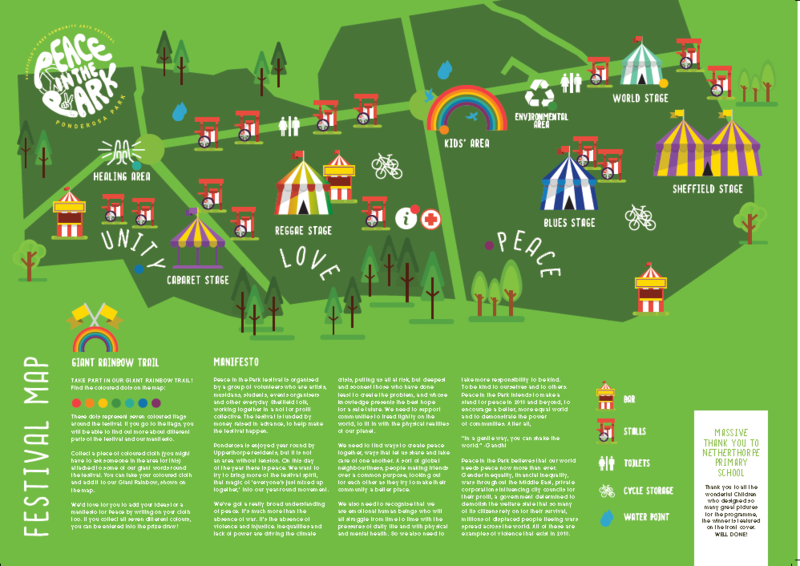 Some new features with a bike area, a youth music stage and a world record attempt, alongside all the usual bands, stalls and great atmosphere. We raised £2500 which was split between Sheffield Mind and Self Help Africa. A third year on the Ponderosa and some beautiful weather led to a fantastic day for all who came along. The giant letters (Peace, Love, etc.) were back again, the bands provided music to keep people dancing all afternoon and £1400 was raised for the Sheffield Teaching Hospitals Lukemia Appeal and Osotua – supporting Massai women struggling with droughts. Peace in the Park returned for the second year to the Ponderosa, where despite the unkind weather, festival goers had the wicked time that they have come to expect, and £2000 was raised for Village Aid and Nomad. In 2008 we raised £3000 for Art in the Park, Ben’s Centre and Chernobyl Children Lifeline. 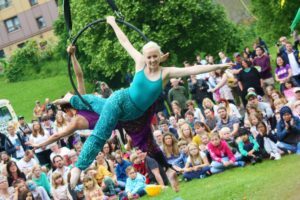 The festival moved to the beautiful Ponderosa Park in Upperthorpe and it was right good! Peace in the Park returned to Endliffe Park amongst slavering sea monsters, poetical pirates, brilliant bands, searing solo-musicians, delightful DJs, coruscating comedians, demonic drummers, face-painters, films, fantastic food, and much more festival fun! See Flickr and Indymedia for pics. We raised over £3000 for Sheffield Assist and Stepping Stones Nigeria! We raised about £1500 for our nominated charities the Sheffield Archer Project, a charity providing support for the homeless, and the Intermediate Technology Development Group, an international charity working on practical ways to end poverty for people in need all over the world. The festival was in The Sheffield General Cemetery between Ecclesall Road and Cemetery Road. 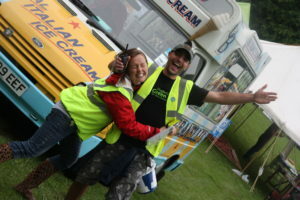 In 2004 the festival moved to the lush Endcliffe park, giving enough space for the festival to accommodate a live stage, open-mic stage, healing area, democracy cafe, dance tent, kids area and many more stalls. Money was raised for Assist, a charity supporting destitute asylum seekers, and Water Aid. In 2003 the first Peace in the Park was held on Devonshire Green in Sheffield City centre, evolving from grassroots protests in opposition to war. 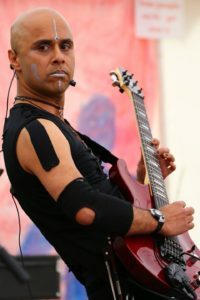 The festival hosted a venue for local bands, artists, musicians, campaigning groups and members of the public to come together in unity, making a solid commitment to peace.